Last night I went to see Sir Les Patterson and Dame Edna Everage at the Royal Albert Hall. What a disappointment. I last saw them on stage about 15 years ago. I remember leaving the theatre with my cheekbones hurting because I had laughed so much. It was rather different last night. It started well with Les Patterson delivering 15 minutes of the kind of filth we have grown to love him for - but then it all went wrong. He then proceeded to deliver a rambling monologue, accompanied by a full orchestra, about a story called "Peter and the Shark". It wasn't funny, it wasn't memorable. In fact, it wasn't anything. Few people could work out the point of it, apart from filling 25 minutes. Then Dame Edna came on and did her usual stuff, all of which was amusing and well received. She then brought out this huge file and then spent thirty minutes giving is a musical history of Australia, again accompanied by an orchestra and also a full choir. There were moments of humour, but for the most part it was dreadful. The only bits of light relief came when she missed her cues completely. OK, I suppose the Albert Hall isn't the idea venue for pure comedy, but I think most people just wanted pure, unadulterated Dame Edna and Sir Les. And what they got was something very different. I'd estimate that a sixth of the audience left before the end. I have to admit I was very tempted to join them. Absolutely agree. Been around too long with same type of jokes. I also remember leaving a theatre simply aching from laughing at what was then one of the funniest acts around. Always preferred Sir Les to Dame E.
I saw him (I refuse to refer to 'her'!) in London over 30 years ago; 'Housewife Superstar', I think. Gawdonly knows how he has managed to milk the same dull characters for - what is it? - nearly 50 years now. Back then he also had Sandy Stone (the dying old geezer) which/who was maudlin, tedious and crunchingly un-funny. 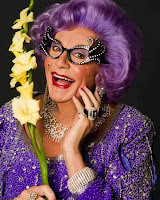 Neither the Dame Edna nor the Sir Les character has developed much ove the intervening decades. I was invited to see the show the last time it was in London, but couldn't see the point so turned it down. Such a shame that, with all Barry Humphries' undoubted polymathic intelligence, and brilliant ex-tempore wit, he's so unimaginative in still dragging the corpse of a show around the world. Easy money, sure, but you'd think he'd have more integrity and imagination. Unfortunately thisis to be expected since the Labour "government" forced "politically correct" comedy on us all, completely ruining the genre. Fortunately, when this leftist rabble are kicked out at the next general election we can have a return to proper, old-fashioned comedy - not this "alternative" comedy which is more an "alternative to comedy"! Absolutely right Ian. Been around too long with stale act. I also recall leaving a theatre many years ago with aching sides from the then wonderful show. Are you quite sure it wasn't Gordon Brown and Harriet Harman you were listening to? Sir Les had some good lines: "Ive been as busy as a Baghdad bricklayer..as a one-armed taxi driver with crabs..as Peter Mandelson's urologist..."
Presumably this was a parody of Prokofiev's "Peter and the Wolf". Perhaps Iain and the audience had never heard it, or of it. An evening and knowing you breakfast too. LOL. This is not the first post you have done about going to see a headline act who is long past their sell-by date. Instead of wasting money and time on has-beens and flops, why not go to the smaller venues where you can find some remarkable talent - people who are still hungry enough to want to work like stink, people with new ideas and a heart for what they do? If you want comedy, there are dozens of clubs where the great, the good and the shite come and go, but by that route you can see some of the people who will be headlining next year and people who are just about to break. Just don't sit on the front row. Cant stand the Edna stuff , but the Sir Les act was mint , I suppose reality has overtaken the satire. It looks as if The Guardian's reviewer agrees with you. I guess comedy is having trouble these days. Recessions make jokes not so funny. At least he's still alive. Most great comics pass on early. Oh dear, Perhaps I should go and watch the Posh beat Newcastle instead.